Mostar, an incredible city in Bosnia and Herzegovina, is truly an underrated city. When we were planning out our European travels for 2018, B&H honestly didn’t cross my mind because I hadn’t heard much about it. 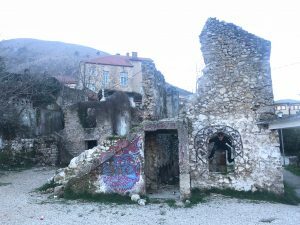 It wasn’t until we were coming to the Balkan region that I started learning of the history and beauty of this beautiful country. 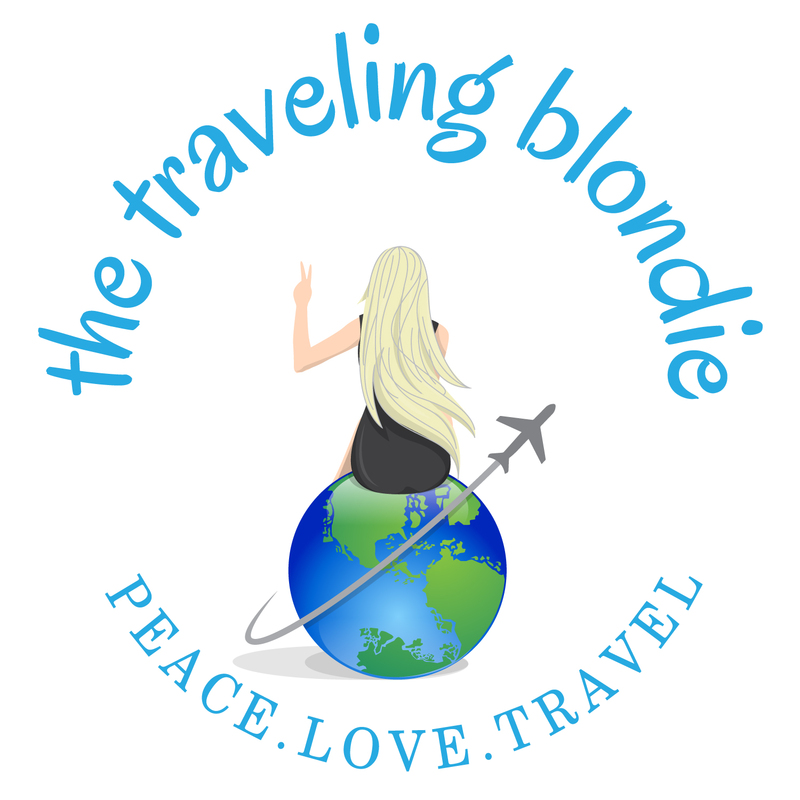 Afterward, I immediately booked our tour to Mostar. Mostar is one of the most ethically diverse cities in the world, which has unfortunately caused great conflict in it’s past. Conflict still continues to produce division both emotionally and geographically in the city. Cobble stone lined streets, beautiful Turkish architecture, and war torn history makes it such a uniquely beautiful city that should certainly be on your list. The summer months are peak time to visit Mostar. Since the town is small with narrow streets and there are large crowds, I can imagine that it wouldn’t be as fun bumping into everyone. We visited in February and basically had the entire city to ourselves, although it was chilly and some restaurants and shops were closed. It’s best to visit in spring or fall, when there are less crowds and the weather is not as hot. You can get to Mostar by renting a car, traveling by bus for $19USD one-way (the journey takes 3 hours and 30 min), or by taking a day trip. We chose a day trip and I regret not spending more time there, honestly. If you can go for several days, I highly suggest it. Our Day Trip via Viator was absolutely perfect. Our local guide was kind, super knowledgeable and spoke fantastic English. The ride to Mostar itself is unforgettable, as you wind along the coast of Croatia, and then through Bosnia & Herzegovina. The tour stops at two different sites along the way to Mostar. 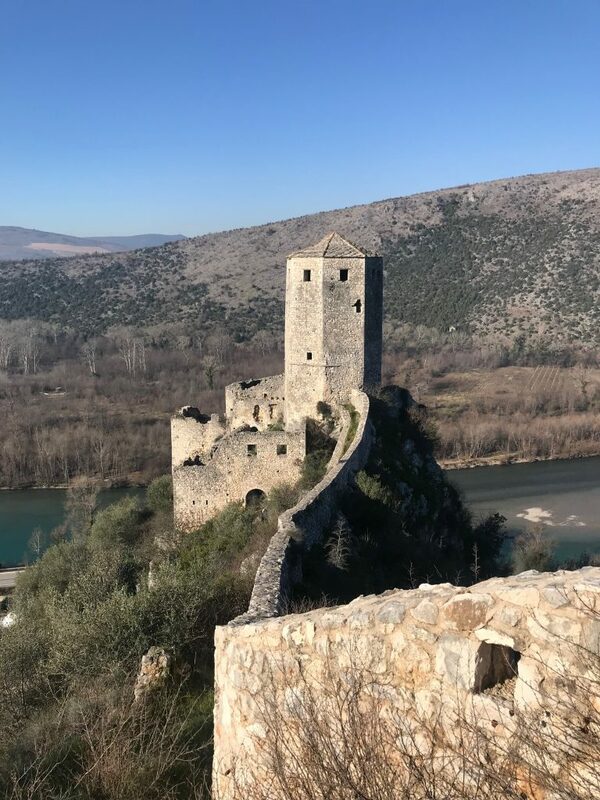 The first stop on the tour is at the beautiful stone town of Pocitelj, which was named a UNESCO World-Heritage site in 2007. Pocitelj was constructed in the 14th century and the views from the fortress atop the hill are beautiful. It is a wonderful first introduction to Bosnia. 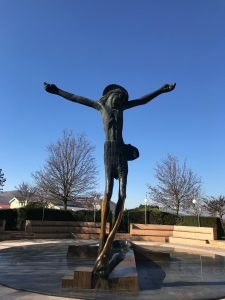 The second stop on the tour is Medjugorje, an important Christian pilgrimage town. It’s a famous site, because in 1981 six local children said they believed to have seen the Blessed Virgin Mary. There have even been continued reports of her appearance, making this a very holy place. 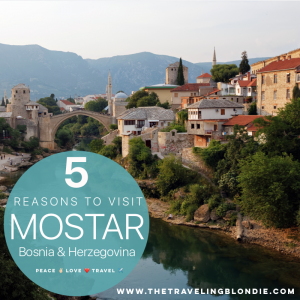 The third stop along the tour is the beautiful city of Mostar. 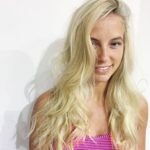 I’ve highlighted the Top 5 reasons why you need to visit this incredible city! 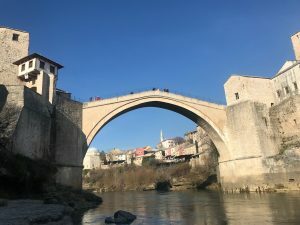 If you Google ‘Mostar’ the first image that will be displayed will certainly be Stari Most, which translates to ‘Old Bridge.’ Stari Most is the beautiful bridge that crosses the Neretva River, connecting the eastern and western parts of the city. Constructed in 1566, the original bridge was destroyed on November 9th, 1993 during the war. It was reconstructed in 2004 and named a UNESCO World Heritage Site in 2005. Professional Diving off the bridge is performed daily and the tradition dates back to 1664, when the first person jumped off the bridge. It has now become an attraction for thrill seekers to plunge 20 meters below into the freezing cold river (even in summer it doesn’t get past 60 degrees Fahrenheit (15C). Do note that it is mandatory to have proper training prior to the jump and costs 25 Euro ($31USD). You can find trainers roaming around the bridge in their swimming trunks. I am absolutely in love with the cobblestone streets, quaint shops and Turkish houses of Old Town. 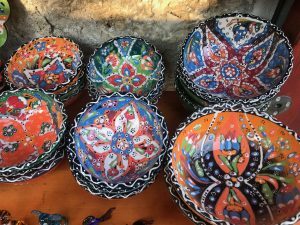 Be sure to visit čaršija, the market of Old Town, which offers up hand painted pottery, rugs, souvenirs and so much more. Just a 10-minute walk from Stari Most, is the Muslibegović House, which housed the Muslibegović family. It is now a luxury hotel and museum. For the BEST views of Stari Most, head over to Koski Mehmed Paša Mosque, which is a beautiful structure all in itself. Finally, if you have time, which we sadly didn’t, the War Photo Exhibit is a MUST see. It captures the tradegy of the more than 200,000 people that lost their lives in the war between 1992-1995. When you walk through the quaint city streets, it’s hard to believe that so much conflict and tragedy took place in this city, no more than 25 years ago. Much of the war during the 1990’s was fought in Mostar and the scars still can be found all over the city. Buildings sprayed with bullet holes, crumbling walls, and visible bomb damage. Abandoned buildings can be found almost everywhere, adding to its very raw, real, recent history that still has open wounds of a divided population. Be sure to see the emotionally moving ‘Don’t Forget’ Stone, located near Stari Most, which serves as a reminder of the recent civil war. The number one thing we love to do when exploring a new city or country is EAT the local food! If you’re vegan or vegetarian, Bosnia and Herzegovina will be a tough visit (it was for me), as the local culture primarily is meat based. Local food is a mix of Turkish and Mediterranean cuisines. 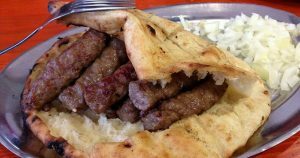 A must try dish is Cevapi, which is basically small lamb and beef sausages served with pita bread and raw onions. Do NOT leave this country without trying Burek, a flaky pastry filled with spinach, chees or meat. 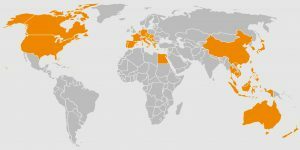 You can find Burek just about everywhere. To more than appease your sweat tooth, finish off your meal with Baklava, a small flakey cake made with layers of nuts, honey and syrup. It is SUPER sweet, but super yummy! Bosnian and Herzegovinian coffee is an experience all in itself, as preparing and drinking it is a local custom that has been around for centuries. The locals drink it slowly while visiting with family and friends. If you’re a collector, a coffee set is the perfect take home gift from Bosnia & Herzegovina. If you drink alcohol, do NOT miss the local red wine, it’s some for the best we’ve ever had! If you’re a wine lover, head to the vinyards in the city of Trebinje, the heart of Bosnia’s Wine Country. A little goes a long way in this city. 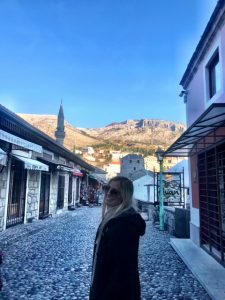 We came to Mostar after staying in Dubrovnik for 6 weeks and it the prices were drastically different, yet the quality seemed just as good, if not better. If you’re into shopping for homemade crafts, then you can really get a lot for your dollar here. Currency is the Bosnian Convertible Mark, but they also accept the Euro and the Croatian Kuna. The recent war is a sensitive topic, for just reasons. Many of the locals had friends and family killed in the war. Please be respectful to the locals and take a tour if you’d like to learn more about the war. Many don’t enjoy discussing it. The city is divided physically by the bridge, but also culturally between east and west. The Bosniak side to the east and Croat side to the west.